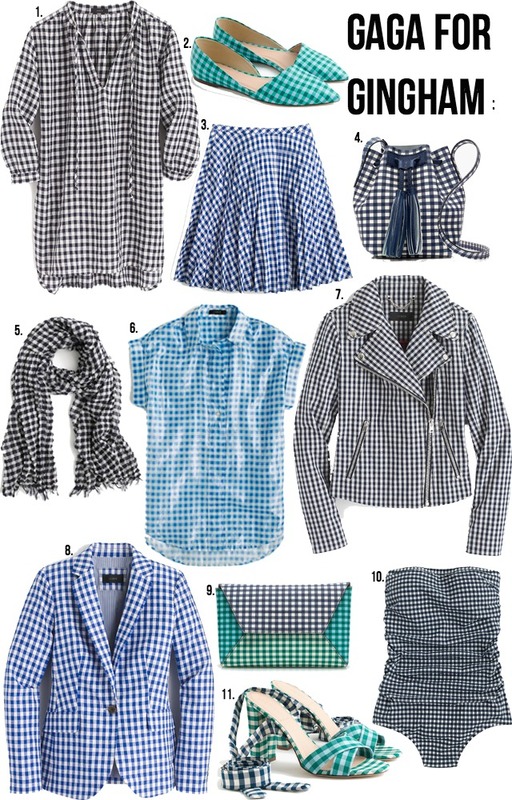 So today I thought I'd show you some of my favorite gingham items for Spring. As you can probably tell, this is a huge trend for this Spring and coming Summer seasons. I love gingham and have for awhile but now I can find it anywhere! When I was at J.Crew on Monday I ended up getting this gingham skirt, tunic and bag. The bucket bag is seriously to die for! It is even better in person and everything listed above is currently 30% off and 40% off sale style with the code 'SCORE'! I also have found great gingham pieces at Old Navy like this matching set which will be coming to a blog near you as soon as the weather is warmer. They also have these cute dress pants and peplum top, plus everything at Old Navy is always on sale so you're bound to get a great deal! I was just there this past weekend and got the cutest dress for $11 and a peplum tank for $8. Everything at Old Navy is currently 30% off with code 'THANKYOU'. The last place that has some great gingham pieces is Ann Taylor. I don't shop there, but I am currently love their adorable heels and slingback flats, their fancy matching set and a dress perfect for the office! I hope you were able to find something you like, let me know if you love this gingham trend or if it is to much! Happy shopping!